Yes there is no doubt that our classics are invincibly amazing, but sometimes we need to pamper ourselves with something new and unique. In addition, A trendy look makes you feel confident and adds bling to your personality. We must not restrict ourselves from experimenting and trying on new things, as it can really put you off. How about picking up an unconventional Lip Colour for the upcoming weekend party? A blue shade can make you look absolutely stunning and out of the box. As it has already made headlines in the upcoming fashion weeks. If you are in love with the sky and its vitality pick up a lighter shade. Or if you wish to add on a navy syndrome, look for its other variant. 1. Party Pop Up: If you are going for a casual cocktail party, a blue lip shade is the right choice to make. It goes easy on any dress and will provide you an easy escape from all that mess of putting on an elaborate make up. 2. Simple yet Gorgeous: If you have a serious liking for plain gowns and dresses with a single shade of colour on them, a blue Lip Shade can lift you up. It will add an unconventional flavour to your style statement and this is where you will look different from others. Just club it up with a hint of pink blush on your cheeks along with a thin layer of mascara, and you are good to go. 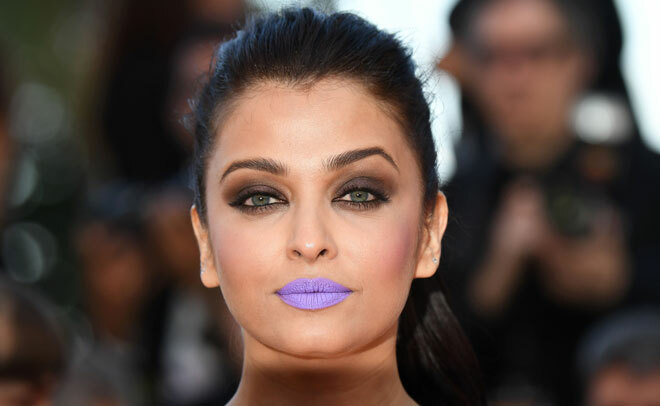 Aishwarya Rai Bachchan, an epitome of beauty chose to experiment with her look at the Cannes Film Festival by putting on a violet lip shade. It had become a debatable subject for critics all over the world for a long period of time. Nevertheless, Unconventional Lip Shades seem though exotic, but this is where there beauty lies. 3. An Effective Concealer: If your lips are of an uneven tone or you have issues like dark lips or wrinkled lips, a blue Lip Shade is an easy solution. It will give you a trendy, sweet and a casual look with all flaws hidden. Lipsticks have titanium oxide which help them to act as useful sun guards. So it will also repair unattractive, damaged lips. 4. Blue lipsticks are excellent highlighters. They brighten your face and enhance your lips, making them appear fuller. Its unusual shade will lift up your overall appearance. 5. Blue is a colour of power: it is extremely eye catchy and attractive. Most women who use a blue lip shade believe that it makes them appear more active and full of energy. It has altogether a different grace of its own that any other colour can never bring to your face. It conceals the symptoms of fatigue and exhaustion from your face. So it is time that you move beyond the clichés of pink and red.